A shift dress is always a great idea. Year in and year out, this type of dress never goes out of style. Add in a fun bold print and you had me and let's get shifty! I mean, how can you not buy this mixed print beauty? 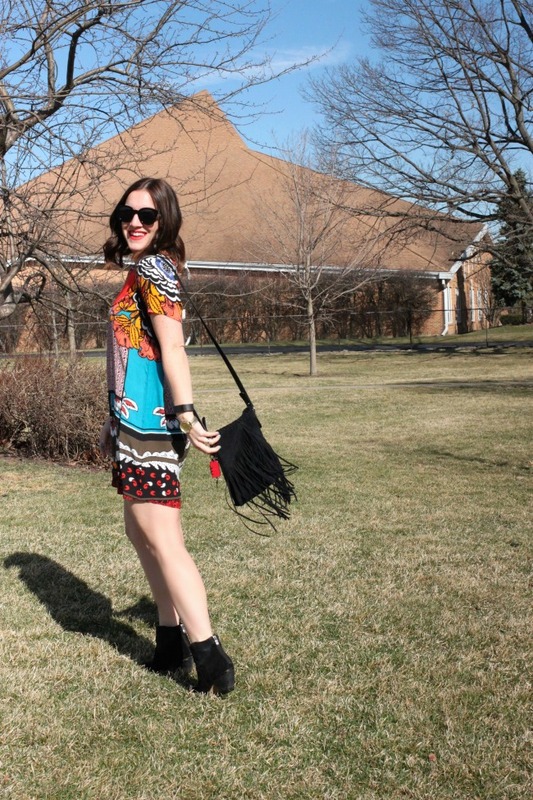 I kept the styling super easy by adding a crop boot, faux leather jacket, and a fringe bag. To finish my outfit off, I added a bright lip and great black sunglasses. Can I just say, I am loving this sunny warmer weather we are having? OK, sure it's going to snow in a few days (welcome to Chicago weather), but Spring is for sure on its way. I am so ready for consistent warmer weather!